Looking for more info on us and our work. Visit our facebook page now for closeup photos of our most recent jobs. Click Here or on the image. Before you read about our labor intensive installation process, please read the "Lifetime Epoxy Difference"
Our documented 5-Step application process is one reason home and business owners chose to purchase our services. That detailed and advanced process combined with the fact we only use the very best quality chemicals and materials available make our floors the best you can buy. We only use non-toxic chemicals with low VOC (See VOC definition below) so that harmful vapors will not be produced that could possibly affect our workers, your family or pets. If you are the business owner, it will not harm your employees or customers. All of our installers are trained, certified, authorized and highly experienced in epoxy floor coating applications. We start with a diamond grinder to process your existing floor to a sandpaper-like finish. This sand paper finish insures that the industrial 2-part epoxy seeps into the mechanically opened capillaries of your floor surface to create a solid-state bond with absolutely no peeling properties. Note: If there is any crack or pit repair to be done, a second technician will be using a "crack runner" tool to prepare the cracks and pits for our "flaw repair" compound. We calculate the exact chemical mixture needed for the base coat of our industrial 2-part epoxy. This base coat must be applied flawlessly and with exact preciseness to insure a complete, seamless, beautiful finish. The chemical is poured and spread with rollers. The reaction time of this chemical mixture varies according to temperature and moisture. Our installer technicians are trained in assessing and manipulating this cure time if needed. One of the extra advantages of a Lifetiime Epoxy chip-coverage floor is that we always broadcast 100% chip coverage. We elect to do this for three reasons; 1. It makes your look look great with a terazzo or granite like finish. 2. 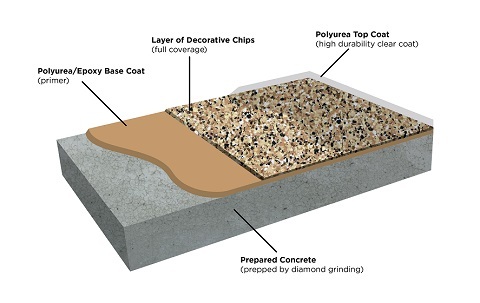 Full chip coverage provides better cushion and added protection for your floor surface. 3. 100% chip coverage makes the floor finish perfectly uniform with a texture finish. Some homowners elect to go with solid colors. If you desire a textured solid floor finish, our technicians cal add a "granular agent" to provide a more non-slip finish. A bonding sealer is added. A top coat of polyurea is added. This is one of the most difficult challenges of epoxy floor installation. The reaction time of this top coat is another factor that our trained technicians can determine and properly adjust to if necessary. Application speed, uniform tool movements, and proper application approach is crucial during this final stage to insure a consistent, uniform, and aesthetically appealing floor that has the durability and performance level we warrant our floors to provide. This top coat is formulated to provide UV protection and extremely durable finish. VOC Explained - You do not need to worry about this, we use non-toxic chemicals with very low VOC properties. Volatile organic compounds (VOC) means any compound of carbon, excluding carbon monoxide, carbon dioxide, carbonic acid, metallic carbides or carbonates, and ammonium carbonate, which participates in atmospheric photochemical reactions, except those designated by EPA as having negligible photochemical reactivity2. Volatile organic compounds, or VOCs are organic chemical compounds whose composition makes it possible for them to evaporate under normal indoor atmospheric conditions of temperature and pressure3. This is the general definition of VOCs that is used in the scientific literature, and is consistent with the definition used for indoor air quality. Since the volatility4 of a compound is generally higher the lower its boiling point temperature, the volatility of organic compounds are sometimes defined and classified by their boiling points. Organic chemical compounds1 are everywhere in both indoor and outdoor environments because they have become essential ingredients in many products and materials. Outdoors, VOCs are volatized or released into the air mostly during manufacture or use of everyday products and materials, while indoors VOCs are mostly released into the air from the use of products and materials containing VOCs. VOCs are of concern as both indoor air pollutants and as outdoor air pollutants. However, the emphasis of that concern outdoors is different from indoors. The main concern indoors is the potential for VOCs to adversely impact the health of people that are exposed. While VOCs can also be a health concern outdoors, EPA regulates VOCs outdoors mainly because of their ability to create photochemical smog under certain conditions. Although the same term “VOC” is used for both indoor and outdoor air quality, the term is defined differently to reflect its predominant concern in each context. This has created a misunderstanding in the marketplace and in the environmental community. In addition, the measured quantity and composition of VOCs in the air can vary significantly depending on the measurement methods used, which has generated additional confusion.